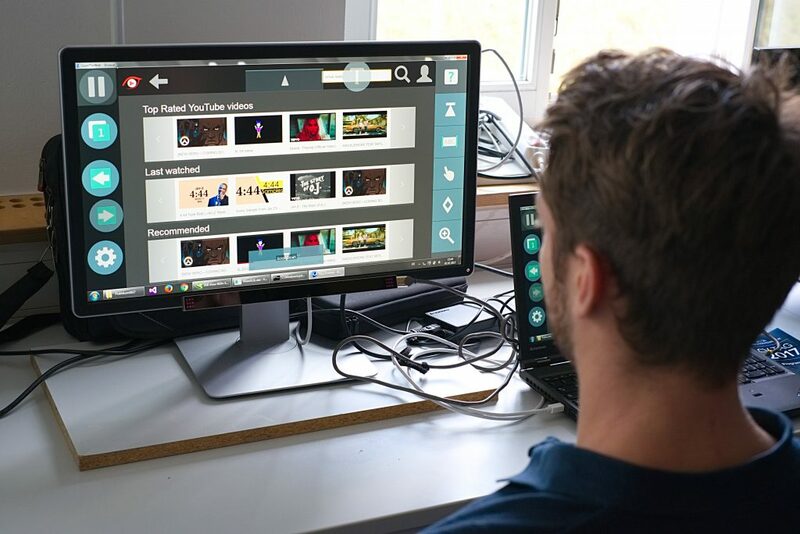 eyeTube is a customized Web application, which receives data from YouTube API and revises the interface elements, so that the end-user can browse, search, rate and rank videos by eye fixations. Moreover the eye-gaze data during watching is recorded, which can be later visualized by the users (to analyze the hotspots in the watched videos) and also used to estimate similarity for ranking and recommendation of videos to other users. The webpage functionality is harmonious with gaze-driven browsers and can effectively work with GazeTheWeb. The application was developed by research lab students of “eye-brain interfaces” at WeST institute Koblenz, and the demo was presented by Ramin Hedeshy and Matthias Greber at CV TAG. The CV TAG is an open day exhibition organized by computer visualization group at University of Koblenz, Germany. The demo projects cover various fields of computer science research like image analysis, graphics rendering, augmented and virtual reality or robotics. The event provides all potential students and companies with the opportunity to gain a deeper insight into the projects and the professional opportunities of computer visualisation. Read NextOur paper on Error Related Potentials accepted in ACM Multimedia, The premium conference in Multimedia!